Zambia is mourning legendary defender Harrison Chongo, who died on Thursday. The 42-year-old was part of the team that was reconstituted after a plane crash killed most of Zambia's national squad in 1993. At the peak of his career, Chongo is remembered for marshalling Zambia's defence in the 1994 Africa Cup of Nations final, which Nigeria won 2-1. Chongo, who was coach of boyhood club Mufulira Wanderers at the time of his death, died from suspected malaria. After 18 national team players died when their plane crashed en route to a World Cup tie in Senegal, Chongo - an unused squad member at the 1992 Nations Cup - swiftly made his international debut. Born in Mufulira in Zambia's copperbelt province, he went on to play in three Nations Cups - 1994, 1996 and 1998 - before departing the international scene in 2000. The high point came when Zambia's patched-up team made the final of the 1994 Nations Cup against the odds. Football Association of Zambia (Faz) president Kalusha Bwalya led the praise for his former Chipolopolo team-mate. "It's devastating to learn that our colleague, friend, brother and a man I personally have fought so many battles with, has passed away," Bwalya said on the Faz website. "Personally, it is a very sad, very sad loss and I think the football community and nation will receive this news with sadness and a deep sense of loss. "We have lost a great warrior who did his country proud. He will be sorely missed." The man many Zambian fans referred to by his nickname of 'Wawa' started his career with fallen giants Mufulira Wanderers aged 16. Coincidentally, Chongo was overseeing a domestic league match involving Wanderers on Wednesday when he developed a severe fever at half-time. He was rushed to hospital where he died the following day, leaving behind six children and a pregnant widow. 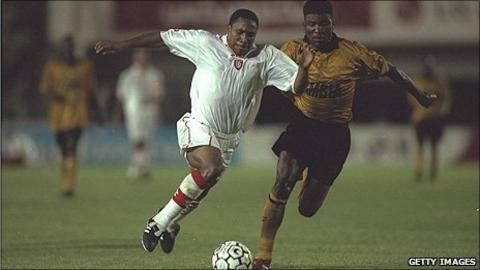 Chongo, who was voted in Africa's best team of the 1994 finals in Tunisia, rose to stardom while playing for Saudi Arabian side Al-Tawoon, the only club he ever played for apart from Wanderers. Despite once attending trials with English sides Barnsley and Crystal Palace, he ended his career with Al-Tawoon with whom he earned a lucrative wage. In retirement, Chongo became a destitute after losing his savings to money sharks. He once lived in a house that had no running water and electricity and could not even afford a bus fare. The six-bedroomed house he lived in was designed to have an in-built bar, huge living room and a big kitchen but it remained incomplete with its ceiling rotten and partially leaking. "All my children, except one, have stopped school because there's no money," Chongo told me when I visited his house in 2006. "Most of my friends have abandoned me because they see no financial value in associating with me. "I am a frustrated person. The best thing I do is drink [beer] at whatever time possible because I don't want to remember the past." But Chongo's love of football was deep-rooted, an affection that will shine on through the names of three of his children - Chelsea, Kluivert and Heskey.